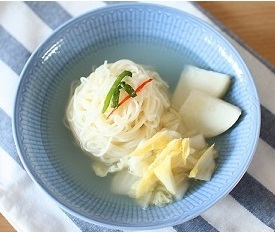 Dongchimi guksu is a popular noodle dish enjoyed by Korean especially during the colder seasons. As the name dong literally means "winter" in Korean and chimi is another term for kimchi, this noodle dish is traditionally consumed during winter. It's essentially wheat or buckwheat noodles in a bowl of cold dongchimi which is a variety of kimchi consisting of daikon, half-boiled egg, baechu (Chinese cabbage), scallions, fermented green chili, ginger, bae (Korean pear) and watery brine. The bowl may also contain ice to keep its broth nice and chilled. Dongchimi is fermented like other varieties of kimchi's, but its maturing period is relatively short, about 2 to 3 days. Red peppers are also used, but dongchimi has a less spicy taste than other types of kimchi and radish is the most important ingredient. It may also include leaf mustard, garlics, gingers, leeks as well as other salted ingredients. Also, the clear and clean taste of the watery dongchimi can be used to make naengmyun or just served with tteok and/or steamed sweet potatoes to balance out the rich flavors.